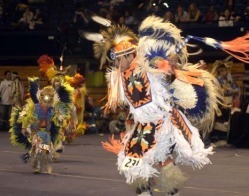 The Ojibwe have many different traditions, the most well-known being their Pow Wow celebration. The Pow Wow plays an important role of celebrating Native American culture and has some religious significance. Pow Wow is a time when hundreds get together different aspects of Native American life and art. This is a time where people come together to celebrate the history of a people and utilize various art forms for recreational and competitive purposes (Flett). The Pow Wow is a celebration that can last anywhere from 5-6 hours to three days. Pow Wow celebrations were restricted until World War II. The majority of people within the United States viewed all Native American dances as “war dances.” Pow Wow was restricted out of ignorant fear of the people uniting for attack. Pow Wow was re-established as a means of celebrating the return of Native American veterans (Flett). • Round/Circle Dance: A ring of people who dance in unison. Circling to the left facing inward. • Straight Line Dance: One of the oldest Plains Indian dances. It has a primary straight posture and the dancers move up and down, keeping in beat with the drum. • Slide/Shuffle Dance: The music has a double beat but can be changed to a more staggering beat to become the Crow Hop dance. • Stomp Dance: The dance starts in a kneeling position and precedes to imitate bravery in battle. • Grass Dance: One of the oldest dances still used in Pow Wow today. The dancers imitate grass swaying in the wind. • Jingle Dress Dance: As you can guess, the dancer wears a “jingly” dress covered with various objects such as: small hawk bells, shells, and sewing thimbles. This dance originated as a medicine dance. • Fancy Shawl Dance: One of the most popular dances with women; it started with middle-aged, tribal women and spread to the younger women as well (Flett). Another important feature of Pow Wow is the music. Pow Wow consists of a myriad of songs that originated in the Grass Dance Lodge; only songs from the Grass Dance Lodge are performed in the traditional Pow Wow celebration. The songs have been passed down through generations of oral tradition; however many songs have been lost as well. These songs are sung by men and women; often time the men lead the song and the women echo or add harmony (Flett). The songs used a Pow Wows have great spiritual significance. Most of the songs came to people through dreams or visions. A common belief is that each time the song is sung or performed the song gets richer (Flett). More than anything else, the drum is the focus of the Pow Wow. 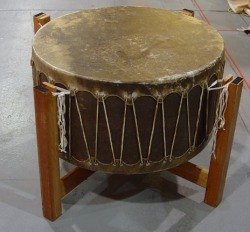 The Pow Wow drum is approximately 3 feet in diameter and made of wood and hide. The circular shape of the drum represents the circle of life, and the wood and hide represent honesty and sharing with the natural world. During the Pow Wow, the drum is surrounded by four or more singers. The drumbeat symbolizes a unified heartbeat (Flett). The significance of the drum comes in through the symbolism of interdependence. The materials used to make the drum come from animals and trees, both living things. The people are reminded that the tree grew depending on the soil, water, and pointed into the air to the Creator. The drum reminds the people of their dependence on their Creator and the rest of the earth (Flett). The drum is a very sacred object and is made only for sacred use- never as a toy or craft. Before the drum can be sounded, it must be blessed by and elder. Once the drum is blessed and formally ready it can be played at any Pow Wow. The drum must be taken special care of, so it is placed under the care of one or a group of people. One person, the “drum keeper” or “drum carrier,” is placed in charge of taking care of the drum and doing any repair work. Out of respect, nothing can ever be placed atop or across the drum. Flett, Harold. "Customs and Beliefs." Customs and Beliefs. Chi Ki Ken Da Mun. 19 Apr 2008 <http://www.nald.ca/CLR/chikiken/titleiii.htm>. Roy, Lorene. "Ojibwa." Ojibwa. 27 Apr 2008 <http://www.everyculture.com/multi/Le-Pa/Ojibwa.html>.